The only person more zealous than a non-smoker is a reformed smoker. They can talk the leg off a donkey about the dangers of smoking and how good it is to breathe. Well I am the same about supplements. I am a reformed non-believer. I used to think that supplements were a load of hog wash. That they were an expensive gimmick, that they were unnecessary and that they quite simply did not work. I used to think that I ate properly and therefore I would get all that I needed from my food. How wrong I was. I am now a huge supporter of supplements; these all natural, very good for you, silver bullets. By silver bullet – I mean anything that makes you feel much, much better with little to no effort on your part. And there is little effort with supplements – all you have to do is buy them and pop them in your mouth. This turn around came from evidence based research. Of course. I was watching a BBC documentary – the source of all informed thinking. They were advocating taking magnesium as it was good for stress but it also helped with muscle cramps. That’s when my ears perked up. I was having terrible leg cramps in the night – maybe something to do with the menopause. I thought I would give magnesium a go. I duly bought some and popped it in my mouth. And then I waited. I waited all night and the cramps did not come. Not even a twinge. Well that was game over – I was hooked. This was more than just placebo effect, this was nothing short of a miracle. Next I tried Fish oil to get my omega 3 and my omega 6. My body would function better. It would even help with my mental illness. Some researchers have found that cultures that eat foods with high levels of omega-3s have lower levels of depression. 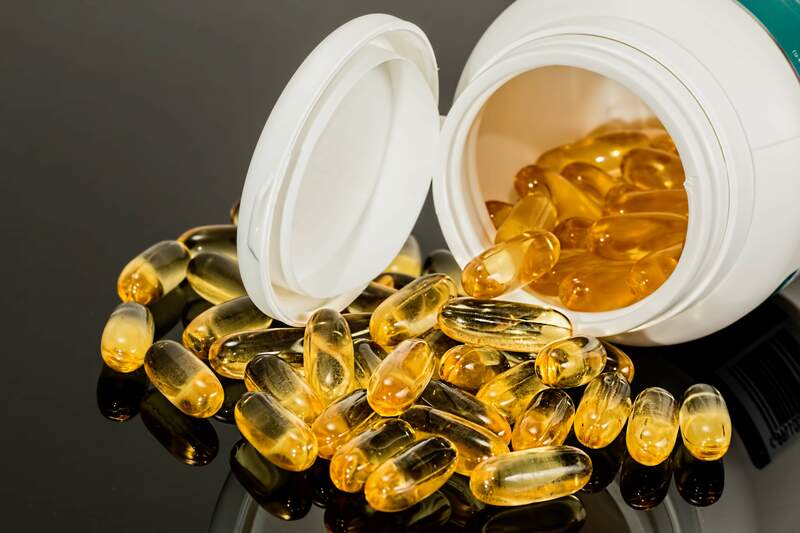 Fish oil also seems to boost the effects of antidepressants and may help the depressive symptoms of bipolar disorder. Count me in. Over the years I’ve heard that zinc was good for your mood. So I thought I would give it a go. When I did it felt like I’d had a nice glass of whiskey. It just took the edge off. It just made me feel smoother. And of course, I had to get a Vitamin B supplement. Good for all things “woman”. Meanwhile, I hear that sodium helps the minerals in your body absorb better. So I’ve started using Himalayan pink salt. Conventional wisdom has said to cut out salt… but what if they are wrong. Advice from the experts changes daily. It can be difficult to troll through and find what is best for you. I recommend trial and error. Just like we do with prescribed medication, it can take a while till you find the supplements that are best for you. Finally, I got one prescribed by my doctor. Vitamin D. I can’t believe my Vitamin D was low, but blood test proved it – I get plenty of sunshine and eat all the food groups high in Vitamin D, but surprise, surprise I need the supplement. It is good for depression, back ache and fatigue. Well get me some now; I suffer from all three. For me, that’s it; for now. I am open to other supplements, but for now I am settled. I have no fear of taking too many. The thing I like about them is that there are no side effects, unlike pharmaceutical medications. The only other one I want to mention is St John’s Wort . It is said to increase levels of serotonin. And that’s a good thing. I’ve never tried it but my Dad swears by it. He gets up in the middle of the night to take it so it will be effective in the morning. But don’t forget, this one takes 2-4 weeks before it becomes effective. A quick search on the internet will inform you as to which supplements are good for what ails you. Remember all you have to do it buy ‘em and pop ‘em. Have a great day. In Recovery Me. About the Author – Kate Hull Rodgers is an expert by experience. She has been mentally ill since 1986, more than 30 years. She is diagnosed as bi polar and GAD (generalized anxiety disorder) Every day she battles to be in recovery, many days she wins. She speaks in corporate workplaces with her company www.humourus.co.uk. She has spoken in 29 countries. Also she runs Stepping Stone Theatre for Mental Health www.steppingstonetheatre.co.uk with her husband, Bill- and she is still happily married. Mustn’t forget, she is the proud mother of Harvey and Dominic – and the dog, Zebbie.